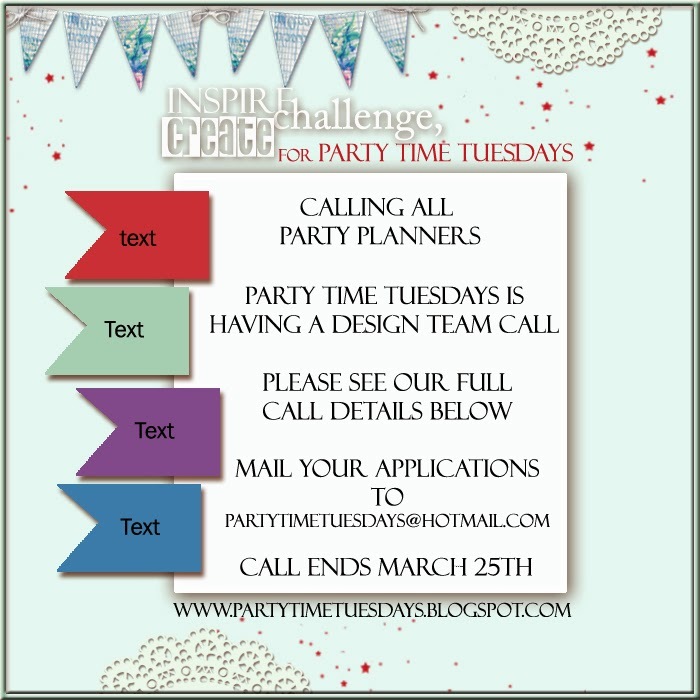 Party Time Tuesdays is looking for an undecided number of Party Planners to join our very unique design team for a term of 6 months. When we say that we have a unique team...we literally mean it. We are the 1st design team dedicated to promoting YOU as an artist! Sound interesting? Well, it is! We do not require you to make new projects we actually want to drive traffic to some of your favorite OLD posts from the past! We want people to see you as an artist. Must be ACTIVE on Google+ and willing to share your post and your teamies post. -Posting old or new projects to the PTT blog and your personal blog 2 times a month (total of 12 posts in 6 months). This is only a snip-it of a photograph and then you link to the actual post on your personal blog. -Participating in our weekly challenges: 1 time per quarter (1 every 3 months...only 2 for your 6 month term!). You can use OLD projects that fit the theme...or make new! -Share your post AND your fellow teamies posts on Face Book at least 4-5 times a week. It's all about promoting! -Comment on our challenge participants entries (this is anywhere between 6-8 comments a week AND it only happens 2-3 weeks out of the month....grand total of an average of 15 comments a month! -Support and comment on your fellow team mates post. Support is the key to the team. The only way we are going to get traffic to your art is to have you help get traffic to your teamies art! -Display the PTT badge on your blog. Food, Food, Food! A party isn't complete without good food! The deadline for submissions is March 25th. The term will start April 1- September 30. Here is how to apply. Send an email to partytimetuesdays@hotmail.com with the subject line: I want to Party with PTT- (and your name). -a SHORT paragraph on why you think that you would be a perfect Party Planner for PTT. -3 unique projects that scream "this is me as an artist"